NO. ANDOVER, Mass. - It took overtime inside Lawler Rink Saturday night, but for the second straight game, the Merrimack College women's ice hockey team suffered a heartbreaking defeat, falling to New Hampshire 4-3. Goal #1 (1-0 MC) -The Warriors skated through its first 10 games with goal in each game's opening minutes; today, Merrimack's first goal continued that tradition. Freshman Gabby Jones fed Katelyn Rae after a UNH turnover, and the senior tallied her second goal in as many nights to put the home team up. Goal #2 (1-1) - Despite the Warriors owning the shot tally in the opening minutes, it was the Wildcats who scored next. Meghara McManus was on the nearside post when a shot from Taylor Wenczkowski ripped a shot that was blocker-saved by Merrimack netminder Samantha Ridgewell; the put-in leveled the game with eight minutes left in the first period. Goal #3 (2-1 UNH) - The Wildcats put three power play goals in Friday night, and were able to take the lead on its second power play opportunity of the afternoon. Nicole Dunbar finished off a shot unassisted to give UNH its first lead of the day. Goal #4 (3-1) -. 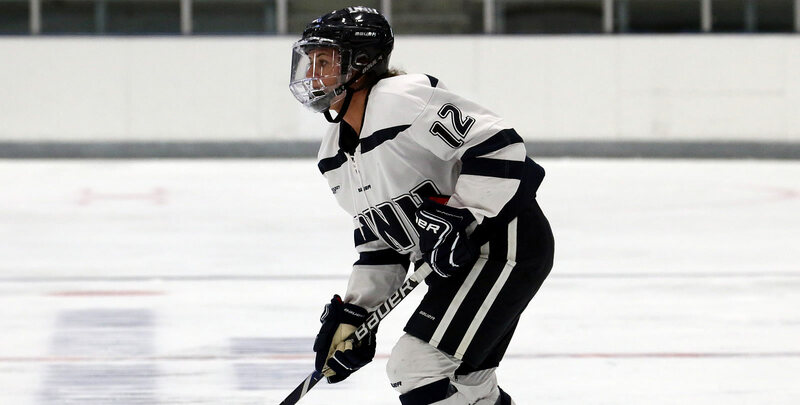 Just 23 seconds later, UNH rippled the net again; this time, Carlee Turner forced a turnover in the neutral zone and beat Ridgewell for the score. Goal #5 (3-2 UNH) - The Warriors weren't going away quietly, and proved so in the early goings of the second period when it went on its second power play of the afternoon. After conceding two early goals, sophomore Megan Fergusson finished a one-timed shot right in front of Wildcat netminder Kyra Smith, with assists being credited to senior Paige Voight and freshman Julia MacLean. Goal # 6 (3-3) - With less than 10 minutes left in the third period, Fergusson found the net for the second time to tie the game. After a Warrior pass through the neutral zone was stolen, Fergusson regained possession, beat two UNH defenders and fired a wrister just inside the blue line that rung the crossbar before crossing in. Goal #7 (4-3 UNH) - Taylor Wenczkowski netted the game-winner, scoring her second goal in two nights just minutes into overtime. Tori Howran and Meghara McManus tallied the assists, and UNH walked out with its second win against Merrimack this season. - Senior Paige Voight has scored four goals in her last four games, including two against Providence. - Four players still have plus-minus tallies in double-digits; Rae, seniors Mikyla Grant-Mentis and Felila Manu, and Gabby Jones. - Merrimack has outshot every team in the third period through the past month.